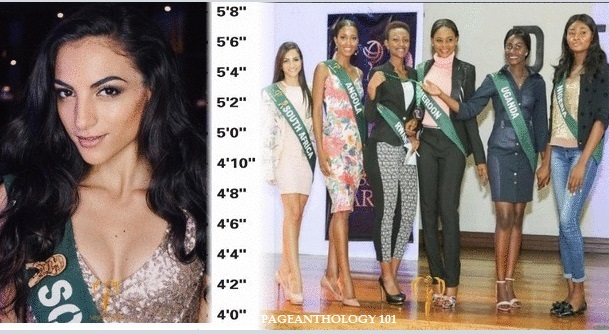 South Africa's bet for the 17th edition of Miss Earth has been disqualified because she was deemed too short. 22-year-old Irini Moutzouris has been eliminated from the competition just 13 days before the final show. 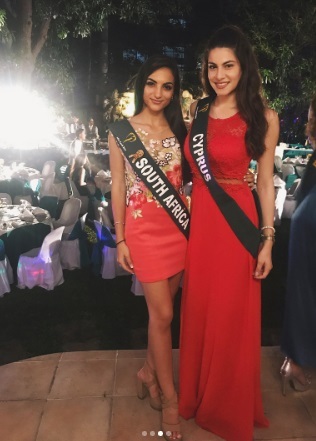 According to Miss Earth website, candidates were required to have a height of at least 5'5" (165.10 cm) and Irini has been ruled "ineligible" because she's only 5'3" tall. Some of the pageant fans and Irini's supporters expressed their frustration on social media. 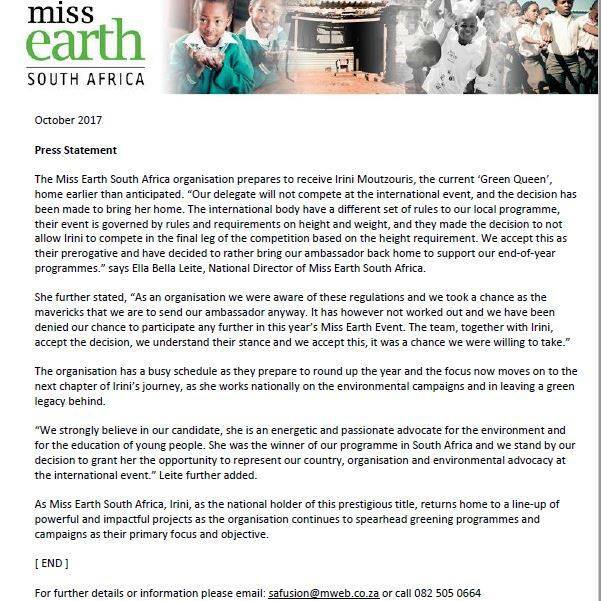 "The Miss Earth South Africa organization prepares to receive Irini Moutzouris, the current 'Green Queen', home earlier than anticipated. "Our delegate will not compete at the international event, and the decision has been made to bring her home. The international body have a different set of rules to our local programme, their event is governed by rules and requierements on height and weight, and they made the decision to not allow Irini to compete in the final leg of the competition based on the height requirement. We accept this as their prerogative and have decided to rather bring our ambassador back home to support our end-of-year programmes", says Ella Bella Leite, National Director of Miss Earth South Africa. She further stated, "As an organization we were aware of these regulations and we took a chance as the mavericks that we are to send our ambassador anyway. It has however not worked out and we have been denied our chance to participate any further in this year's Miss Earth Event. The team, together with Irini, accept the decision, we understand their stance and we accept this, it was a chance we were willing to take." The organisation has a busy schedule as they prepare to round up the year and the focus now moves on to the next chapter of Irini's journey, as she works nationally on the environmental campaign and in leaving a green legacy behind. "We strongly believed in our candidate, she is an energetic and passionate advocate for the environment and for the education of young people. She was the winner of our programme in South Africa and we stand by our decision to grant her the opportunity to represent our country, organisation and environmental advocacy or the international event." Leite further added. As Miss Earth South Africa, Irini, as the national holder of this prestigious title, returns home to a line-up of powerful and impactful projects as the organisation continues too spearhead greening programmes and campaigns as their primary focus and objective. Please leave us your thoughts/comments in the section below.